It doesn’t matter if you have a 60s ranch, an 80s colonial, or you’re bringing the past back to life by refurbishing a centuries-old diamond in the rough, architectural interest can be added to the exterior of any home with cedar lookalike vinyl shingles. For the most aesthetically pleasing end result, vinyl shake and scallop shingles that have been molded from actual cedar planks are the best options. The most natural-looking shingles have a cedar wood grain. Even when you touch them it should be hard to tell the difference between the vinyl shingles and real wood. Like the name implies, scallop vinyl shingles have a rounded bottom and are typically used to offset the gables (peaks) of a house. On some historic homes you might find scallop vinyl shingles covering the whole house. If quaint charm is the look you’re going for, scallop vinyl shingles are a perfect option. The more popular of the two options, and the more contemporary in style, cedar shake vinyl shingles are a stunning accent choice. If a beachy, rustic feel is the design you crave (think Nantucket or the Hamptons) cedar shake vinyl is a perfect choice. Unlike the real thing, cedar shake vinyl shingles will last for years—without the maintenance. You can mix cedar shake vinyl shingles in with traditional horizontal siding to highlight the front of a garage, make gables appear more pronounced, or augment the distinctive beauty of exterior stone surfaces. 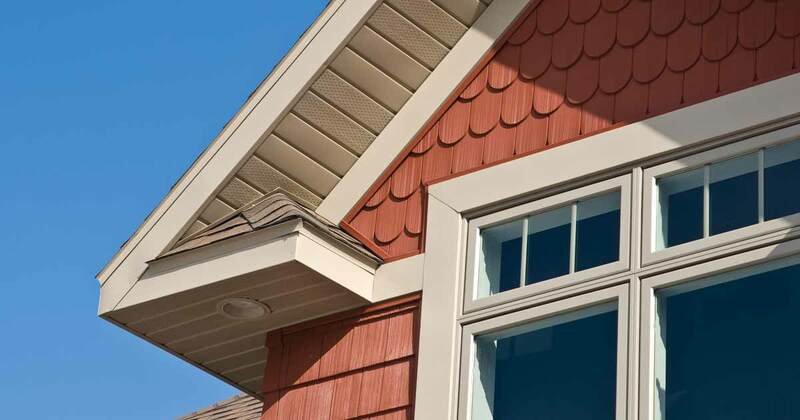 Although a number of vinyl siding companies offer shake and scallop cedar lookalike shingles in different colors, Unishield shake and scallop vinyl shingles can withstand category five hurricane force winds. Unishield shake and scallop vinyl shingles, from Universal Windows Direct, are available in 26 different colors, from traditional to contemporary. You can showcase the beauty of your home, or add architectural interest, simply by mixing shake or scallop vinyl accent shingles in with your exterior remodeling materials of choice. Find out why Unishield Premium Vinyl Siding from Universal Windows Direct, offered at factory-direct savings, is the vinyl siding of choice in Northeast Ohio by calling 216-518-8900, or 1-800-9-TILT-IN (984-5846).